This collaboration between American Ellen Fullman, playing her ‘Long String Instrument’ (a 26-metre string instrument spanning the whole length of the performance room), and the Korean Okkyung Lee playing cello, was recorded in February 2016 as part of the Edition Festival for Other Music in a former bakery in Stockholm. Although recorded live and in a large space, the sound is exemplary, allowing the long drawn-out notes from each set of strings to draw delicate patterns and envelopes across a relatively neutral space. Across two numbered twenty-minutes-ish parts, there’s gradual changes in emphasis and attitude, but generally it’s the long string instrument providing a gentle and elegant drone, while the cello offers up a more speculative collection of sounds, sometimes also droning and playing second fiddle (as it were) but sometimes wandering towards more overt and abrupt performed sections with a dynamism that’s enhanced by a percussive approach to tapping and hitting the instrument. The character of the bowing is powerfully shown as well. It’s a lovely texture, settled and mesmerising, where the strength is in the details. The ‘W’ here is James Welburn, on gritty electronic electric bass drone and feedback, undisclosed objects and effects. The ‘V’ is Juliana Venter, on lyricless wailing experimental-theatre style voices and further undisclosed objects. Together they’ve produced this half-hour long, two-part improvisational catharsis that grumbles, groans and whines in equal measure, a coarse-textured sonic bath of noise and reverb. While the first fourteen-part has the raw energy of the single session it was recorded in, the second part is the product of three later sessions during which the collaboration has clearly begun to mature, with a greater use of lower dynamics and space that allows some of the more subtle atmospheric sound to shine through. However a lesser emphasis on the vocals ends up being to the detriment of the work, which is in danger of becoming run-of-the-mill drone when it loses that distinctness. It’s a strong coming together of like-minded ideas with a gritty end product that deserves to be heard. Populäre Mechanik: Hi-Fi Is Sweeping the Country! Title: Hi-Fi Is Sweeping the Country! Wolfgang Seidel was in a short-lived band PopulÄre Mechanik which disbanded in the 1980’s, then in 2005 formed a new band with the same name, but where he was the only member in common. This is a double LP compilation of material from between 2005 and 2014, from that incarnation of the band. However when listening to it, you could readily believe that some of these hard-edged prog and experimental pieces could have been recorded in the late ‘60’s or the ‘70s, with long wigged-out works coupling electric guitar, complex live percussion and evocative gritty vocals making this psychedelic prog rock writ underground or garage rock writ pretentiously, depending on how you look at it. The apparently improvised vocals are mostly German, with occasional exceptions such as the English “Abstract Days” and “Blooming Carpet”, but it’s not for that reason that those track are highlights- the groove and progression on it is notably more engaging than some of the others. The ordering is unclear but it’s easy to assume from the listening order that you’re listening chronologically and that the move to English came towards the end of the period. In some tracks, like the rather unrepresentative opener “20 Ways To Improve Your Home”, there’s a strong showing for samples, loops and tape trickery. At points it sounds a little like the tape-bending experiments of the 1960’s that George Martin helped to popularise, at other points it’s more structured and has some slight shadows of the 90’s bigbeat era of sample eclecticism. It’s across the minority of the tracks though, more’s the pity as it represents some of the most innovative elements of it. Again if this is a chronological collection, about which I’m unclear, it would seem that the band moved away from it- which is a shame. The nearly-eighteen-minute long closer “Psychedelic Mechanics” functions well as both the end to the journey, and as a self-contained unfolding work in its own right, showing a defter sense of dynamism and melody than was exposed in some of the earlier, more raucous pieces. With its title and artwork referencing the ‘50’s and since I’ve mentioned every other decade from the second half of the twentieth century onwards, this is clearly a release that crosses time- but does seem to be rather focussed on looking backwards. Lovers of psychedelic rock who want to hear something new that sounds old have come to the right place. 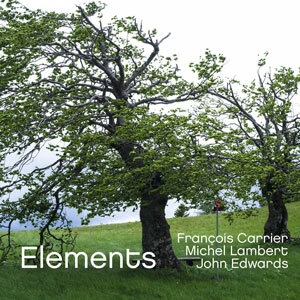 The saxophonist Francois Carrier returns with a new release featuring his usual collaborator Michel Lambert on percussions and John Edwards on double bass. As we are talking about improvised music this is a live recordings from two different concerts: one at the l’Klectik Art Lab, The Horse Improv Music Club in London and the other at the 20th Festival Jazz Cerkno. The first concert, done in 2016, is represented by two tracks: "Elements" which starts, after a quiet introduction with the bass sounding almost like a cello, with the alto sax conducting the improvisation with the rhythmic section sustaining it until the double bass begins to escape his rhythmic role to have a melodic one and so the sax use more melodic phrases and there's more use of silence in a second part where the percussion is used with remarkable restraint. "Roar of joy" is instead essentially an alto sax solo with the rhythmic section underlining the atmosphere rather than doing time beats. "Wilderness" is instead from the other concert, made in 2015, and starts as a prosecution of the previous track as it has more or less the same structure but, in this occasion, the sax lines are more continuous and less fragmented. The second section of the track is based on the interplay between the musician with small, even noisy, sound from the sax immersed in silence with quiet accompaniment by the other instruments until the use of the bow by John Edwards introduces the second part of the concert where there's the alternation between frenetic parts, when the sax use longer lines, and quiet ones, when the language is more fragmented. The readability of the whole structure of the concerts denotes the amalgam between the three musician, so that there's no hint that this is an improvisation, and the idea of movement behind the performance. Recommended for fans of free jazz. The Carbophone is Hirsch’s own invention and the first one was only constructed in 2015, so there’s a tongue-in-cheek aspect to the name “Early Carbophonics”- but despite being an acoustic instrument built with a wooden base and carbon rods, the tone of the instrument, and of this 26-minute mini-album as a whole, is so close to the playful weirdness of 1960’s experimental electronics that it really does sound like a throwback to what might get labelled early electronic music. In terms of intention, it references the African Kalimba or Mbira, and the layered rhythms in pieces like “Octopus Promenade” do have shades of traditional African music, while others like “Balfolk” sound more like Eastern European folk instrumentation reworked into mesmeric repetition that borders on analogue techno. “Castle Moat Robot” would not sound out of place in a Radiophonic Workshop retrospective, while “Full Moon Hula Hoop” sounds like an attempt to construct a more modern, faintly glitch-steppy piece but solely using a wood-toned instrument. Will the Carbophone reinvent music and invite retrospective compilations fifty years from now? I very much doubt it. But is it a pleasant and strangely nostalgic attempt to build something solid and new that rekindles the spirit of musical experimentation? Yes, it is that. And does it work? In a rather sweet way, it does.